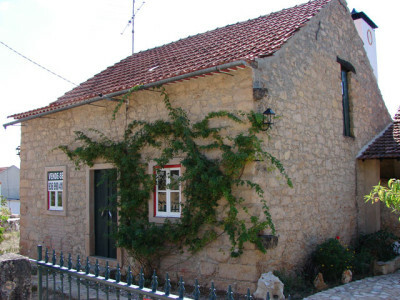 A stone built five bedroom cottage for sale close to the world heritage town of Tomar in central Portugal. The property has been carefully restored and has many exposed stone walls to the interior and exterior. The property is set on a plot measuring 6,000 square metres and has many mature olive and fruit trees. There is a large (64 square metre) living room, a kitchen with fire place, five double bedrooms, a large attic divided into two rooms. The cellar, which has a traditional style wooden ceiling and ceramic tiled floor, has two rooms with stone floors. There are two bathrooms, both of which retain a lot of the property’s character with exposed stone walls. The property, which measures 258 square metres of construction, has a covered parking area and a covered barbecue area to the rear. The property has 6,000 square metres of land, which is all relatively flat, and there are many mature olive and fruit trees. There are three wells on the property. The property is situated on the edge of the village of FREIXO, in Central Portugal. There is a cafe bar within walking distance and the world heritage town of Tomar, which has supermarkets, cafe bars, restaurants, shops, cinema, art galleries, museums, castle, parks and a hospital, is approximately 10 minutes by car. Lisbon Airport is one and a half hours drive and approximately two and a half hours’ from Porto.